2005 Accord LX 4 Cylinder Sedan. ruining the inside tread on the rear tires. What's the best?? Please help make recommendations. It seems there are several camber adjusting parts in the rear. Do I need ALL THIS?! I have this same question as well, depending on where i look i find the upper arm or the lower camber/toe arms. my alignment shop advised i get the lower arms. I got the UPPER Control Arms. The alignment is PERFECT now. I HOPE my tires don't get WHACKED again cuz this is my THIRD SET!! Which one did you get? I was looking at the TruHart camber kit and adjustable upper control arms. Yeah, Duh! Would've been nice for me to let you know which I purchased! VERY High Quality - Heavy Camber kit - I would highly recommend. FOLLOW-UP: So the shop installed the camber kits, and the alignment was "correct" but it STILL WIPED OUT another damn set of tires!! Is it possible to align this car witht he lowering springs / camber kit in place?? Or do I have to revert back to an OEM strut assembly?? I also got the ingalls camber and toe kit along hit the true hart camber arms. 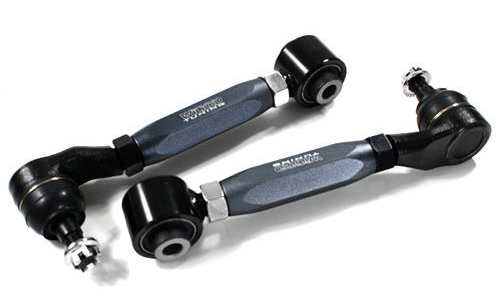 the ingalls kit replaces two of the trailing arms that the camber arm doesn't. So you basically replace three of the arms I think it was $189 for it and its DIY simple just get it aligned after. have had no problems with tire wear sitting on tein street advance coilovers. Quick Reply: 2005 Accord LX CAMBER KIT - Best? ?